The Certificate III in Fitness gives you the skills and knowledge to work confidently as a gym instructor or group exercise instructor. Victoria University Polytechnic’s Certificate III in Fitness is designed to provide you with the skills and knowledge to work confidently as a gym instructor or group exercise instructor. first aid and risk management. You'll have access to Victoria University’s $68 million sport precinct that includes an aquatic centre, commercial gym with the latest equipment and group exercise spaces. You'll also gain hands-on work experience in a supported learning environment at our custom designed teaching gym on campus. Gain the skills and knowledge to confidently work as a gym instructor or group exercise instructor with the Certificate III in Fitness. You'll also be eligible to apply for registration with key industry bodies including Physical Activity Australia and Fitness Australia. 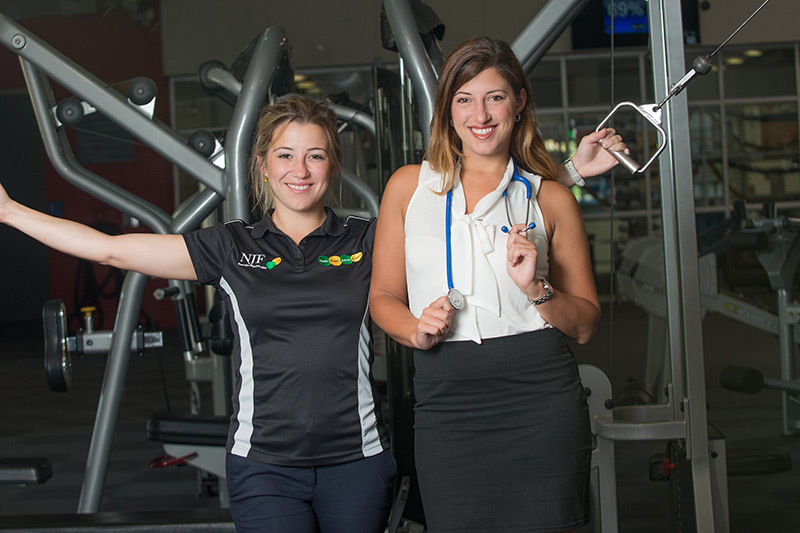 Sisters Bianca and Rosemarie Michetti followed pathways from TAFE to postgraduate study. a maximum of two (2) units may be selected elsewhere in the SIS Sport, Fitness and Recreation Training Package, or any other current training package or accredited course. All Group B and Group C electives must be selected. Group A electives are not currently offered by the Polytechnic. Please note the following units meet the requirements for Group C.
BSBRSK401, HLTAID003 and HLTWHS001 which are listed in Group B.
SISFFIT006 which is listed in Group D.
This qualification reflects the role of instructors who perform a range of activities and functions within the fitness industry. Depending on the specialisation chosen, this qualification provides a pathway to work as an instructor providing exercise instruction for group, aqua or gym programs. They work independently with some level of autonomy in a controlled environment such as fitness, leisure, aquatic and community centres where risks are managed through pre-existing risk assessment and hazard control processes. For employment and practical placement purposes, this vocational sector typically requires a current Working with Children's Check. Failure to provide the required documents in the timeframe specified by the Course Coordinator, means you will be unable to undertake practical placement in a workplace and therefore not eligible to progress in this course.